In this episode…the fellas welcome comedian and Bout Time Podcast host, Patrick Passafiume! 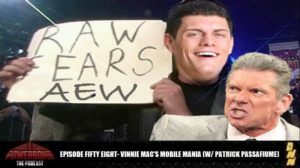 The gang jumps inside the Elimination Chamber to figure out just how WWE and Vince McMahon will react to this current wrestling boom! Also, the fellas unveil their new sponsorship with COLLARXELBOW and they dive into a Wrestlemania-themed “Would You Rather?”! Check it all out in the latest episode of POWERBOMB!